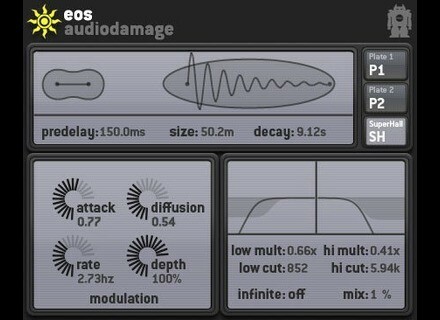 Eos, Software algorithmic reverb from Audio Damage. Product replaced by the Audio Damage Eos 2. 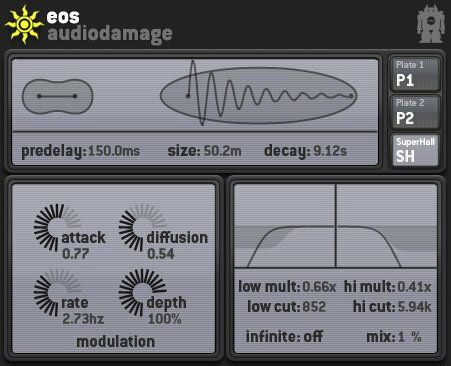 Audio Damage has announced the release of Eos, its new Algorithmic Reverb plug-in for Windows (VST) and Mac OS X (VST/AU). Eos consists of three reverb algorithms, made with the modern production environment in mind, according to the company. Two different plate simulators and Audio Damage's own Superhall algorithm are designed to give you a broad palette of reverb, and the interface supposedly makes adjusting the algorithms to suit your track incredibly simple. "Want a traditional dark plate reverb? Eos can do that. How about a short, dense room sound for your drum buss? Not a problem. But where Eos really comes in to its own is when you drop Superhall on your piano or synthesizer tracks. The long modulated hall sounds of Eno-style ambience are where Eos thrives, something that is made of unobtanium with convolution 'verbs. Quite simply, an impulse response can not do what Eos does, according to Audio Damage." Plate 1 (mono in, stereo out). All standard reverb controls, including modulation rate and depth, attack, diffusion, and full control over the EQ and multipliers of the reverb tail. Infinite control for "freeze" effects. Unique visual controls designed for quick and easy programming. Low CPU usage compared to other algorithmic reverb plug-ins, and far lower than the average convolution 'verb. Full MIDI learn for hardware control of most parameters (VST only). Pro Solovst For Mac AM Music Technology has announced the release of the Mac OS X version of Pro SoloVst, the virtual instrument that reproduces the monophonic analog synthesizer from the early 1970s, the ARP Pro Soloist. de la Mancha Releases Scylla Scylla is a new VST instrument for Windows that combines sample playback with subtractive synthesis to produce a variety of sonic possibilities. Artifake_Labs Announces Meltron MKX v2.1 Meltron MKX is a free VST instrument plug-in for Windows that emulates the Mellotron.